Kids' Party Entertainments > Outrageous! Outrageous! 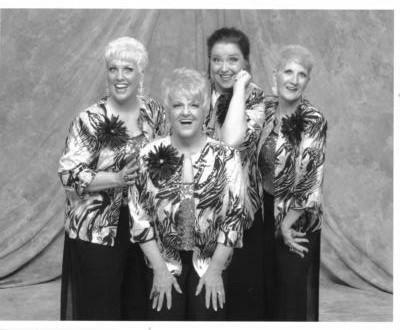 is four whacky and fun females singing and entertaining in the Barbershop style, offering music from the 1920's to current, singing jazzy tunes to beautiful ballads, gospel numbers, and shake-the-floor uptunes! We please audiences of all ages with our repertoire that can last from 15 minutes to 60 minutes or longer, depending on our customer's needs. Please note Outrageous! will also travel to Troutman, Longisland, Catawba, Stony Point, Cleveland, Claremont, Olin, Terrell, Hiddenite, Mooresville, Mount Ulla, Sherrills Ford, Harmony, Conover, Union Grove, Woodleaf, Taylorsville, Davidson, Denver, Maiden, Newton, Salisbury, China Grove, Hickory, Landis, Mocksville, North Wilkesboro, Hamptonville, Huntersville, Iron Station.